Your force is a regiment of renegade White Russian infantry and cavalry under the command of Colonel I.P.Addreski. You have escaped from the Civil War in your motherland and have been wandering through the Back of Beyond, hiring out your services to the highest bidder as professional mercenaries. You are in-between engagements at the moment and funds to pay and equip your troops are running dangerously low. You have heard a rumour that the Imperial Russian gold reserve has somehow ended up in a bank vault in the town of Urga on the other side of the Gobi Desert. You have decided that it is your patriotic duty as a son of Mother Russia to liberate the wealth of the Tsars and return it to its rightful owners. By happy coincidence you are a distant relative of the Tsarina’s second cousin, twice removed, so that means you! 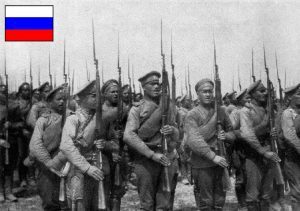 You are now en route to Urga with your troops and have taken the precaution of arming yourself to the teeth in order to fight off any rival claimants to the Tsarist gold, especially those repulsive Bolsheviks and the equally unpleasant Chinese Warlords that you have been working for over recent years. You have no illusions about either of these unsavoury factions, or any others for that matter, so will shoot first and ask questions later! You have also heard a rumour that a beautiful Mongolian Princess is also seeking the gold and, as you are a bit of a ladies man, you have decided that she would be an excellent companion in your quest. You are prepared to cut her into the deal, if she lends her support to your force, especially as she commands the loyalty of many of the Mongolian tribes and clans along the route.